Review: Delirium by Lauren Oliver - Book.Blog.Bake. In a word: Yes. Yes to everything about this book. Yes to the characters, to the premise, to the world, to the story. I was a little wary, because I had just read Under the Never Sky and was a bit disappointed considering how hyped that book had been, but Delirium just blew me away. I love how each chapter begins with a piece of history in this new world: we’re given excerpts from fake textbooks and news articles and even nursery rhymes. It all made it much easier to believe the premise, that love has been ruled dangerous and everyone is “cured” of love at the age of eighteen. I really liked all the characters in the story, which I think is really what pushes this book from good to great for me. Lena is a likable main character who has both believable strengths and weaknesses. Her motivations for actions always made sense to me. Hana, Lena’s friend, is a great character as well and adds a lot to the story–perhaps a little more than she should, since at times Hana is the more interesting character. Alex is a believable love interest who I was drawn to right away, and I really enjoyed all the secondary characters as well, including Lena’s guardians. The best part about this book is that while it is a “Love story”, per say, it is not just a love story, at least not a romantic one. It’s Lena’s romantic interest that finally pushes her to see that she wants love, but throughout the book we see what happens when love is taken away, not just in romantic relationships but in friendships and families as well. Actually, as devastating as the whole romantic development is, I think the most terrifying part of Delirium is when we see families that operate without love. The writing is beautiful, but I also really loved this book because it’s written in a way that assumes some intelligence from the reader. Aspects such as the family relationships aren’t completely spelled out, but they are insinuated. I love world-building, and it’s here, but in bits and pieces through out the book, which in my opinion, contributes to a much stronger book by the last page. Final Impression: Such a solid book with a world that at times is truly terrifying. Ever character is perfect for their designated roles and the stakes always felt high. 5/5 stars. I really loved Delirium. The writing and the passion were so absorbing, I didn’t want it to end. Book Review: Pandemonium by Lauren Oliver | Book.Blog.Bake. YESYESYES I’m so glad you enjoyed this one!!! I was hooked after reading Delirium and I’m anxiously waiting for Requiem. I just love how beautifully Lauren Oliver is able to capture the reader’s attention. I’ve heard such great things about the book. I agree with Under the Never Sky being hyped up. I started it and couldn’t get through it. But I read Before I Fall by Lauren Oliver last summer, and I was blown away by her writing. So beautiful. She is an AMAZING writer. She’s one of those writers that really manage to pull you into the story while still making every sentence sound as lyrical as possible. I LOVED DELIRIUM!! .< Great review! 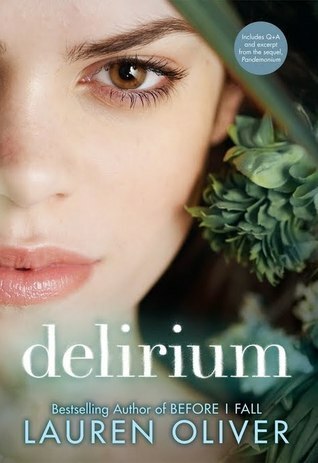 Oops, somehow the rest of my comment went missing, here it is: I LOVED DELIRIUM!! <3 Lena was slightly annoying at first but Alex totally makes up for everything. Lauren Oliver's writing is superb and it all felt so lyrical and dreamy, not that I'll want to live in a place where love is forbidden… Great review!